1942 and two Czechoslovakian parachutists are dropped from a British plane over their homeland. Their mission, Operation Anthropoid, is to travel to Prague to assassinate Reinhard Heydrich, second in command of the SS and the driver behind the Final Solution. They know that they are undertaking what has been classed as a suicide mission, and that the Nazis will exact a terrible revenge on the local population, but Heydrich is considered one of the most powerful and dangerous men in the Third Reich, a key strategic thinker that needs eliminating. But how to write this true tale as a non-fiction novel? A story that involves real people, is surrounded by myth, and has been told many times before? These are questions that Laurent Binet agonizes over as he tells the story. HHhH is two stories wrapped through each other. On the one hand, it is the tale of Heydrich and the parachutists, and on the other it examines through self-reflection Binet’s obsession with the story and his attempt to write it as a non-fiction novel. Binet is uncomfortable with the non-fiction novel for the same reasons that I generally shun the genre - that the focus is real people and events and by fictionalising the story in whole or part the author plays with and re-writes history. 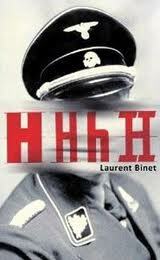 HHhH confronts these issues head on by writing about the process of researching and writing about Heydrich’s assassination and his doubts and anxieties. The story thus unfolds through a series of short sections that see-saw between the two threads. At the start of the novel I was totally captivated by the approach and story. However, as the book progressed it became increasingly tedious and tiresome. The self-reflective elements lose their vitality and at one point Binet states: ‘I’m drivelling, aren’t I?’ To which my response was, 'yes, and you have been for quite some time'. It is not helped by the story of the parachutists being relatively mundane, lacking in spark and voice. Binet is so paranoid about keeping the story ‘true’ that the narrative style reads more like popular history than fiction. Whilst the book will appeal to literary folk and historians interested in the production of knowledge and the role of the author, as a novel it started with much promise but the format ultimately stymied the story. I've just finished this and I'm going to think about my review. It wasn't as good as I expected it to be and I found it very self-conscious. Like you, I kept thinking 'get on with it'. 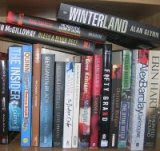 I also thought I was being played around with too much as a reader.